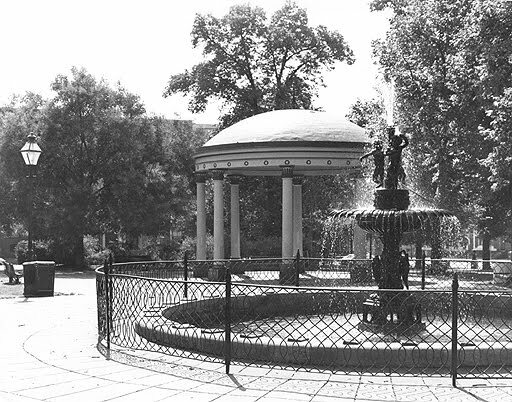 Description: Union Square Park, with its fountain and band shell, is in West Baltimore. UPDATE: The 1930 date is for the founding of the Blakeslee-Lane Studio. The date of photo would be sometime after the fountain was replaced 1976 (the image does not show the original fountain) and the photographer's retirement in 1980. Thanks to Betsy Blades for prompting this correction. The pavilion (identified as a "band shell" in the text) is painted with contrasting trim elements. "The H. L. Mencken Fountain at the center of the square, ringed with 32 decorative metal bookleaves commemorating the author's works, was donated by old friends, including the publisher Alfred Knopf and the owner of Baltimore's old German restaurant, Haussner's."